National Weather Service map shows likely track of Cyclone Rosa. 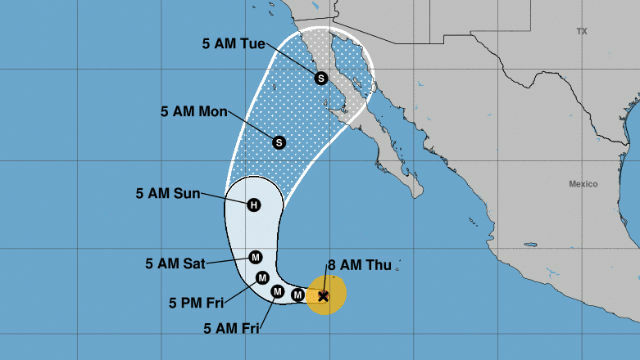 Tropical Cyclone Rosa is strengthening and could bring high surf starting Saturday and rain on Monday as the storm approaches Baja California from the south. “Conditions appear generally favorable for continued strengthening for the next 24-36 hours, and the new intensity forecast now makes Rosa a major hurricane in 12 hours,” according to the National Hurricane Center in Miami. The National Weather Service office in San Diego said Rosa could affect all of southwestern California as it grows. The surf was predicted to be highest at south-facing beaches through Monday, while scattered showers and thunderstorms could develop Monday and continue into Wednesday.